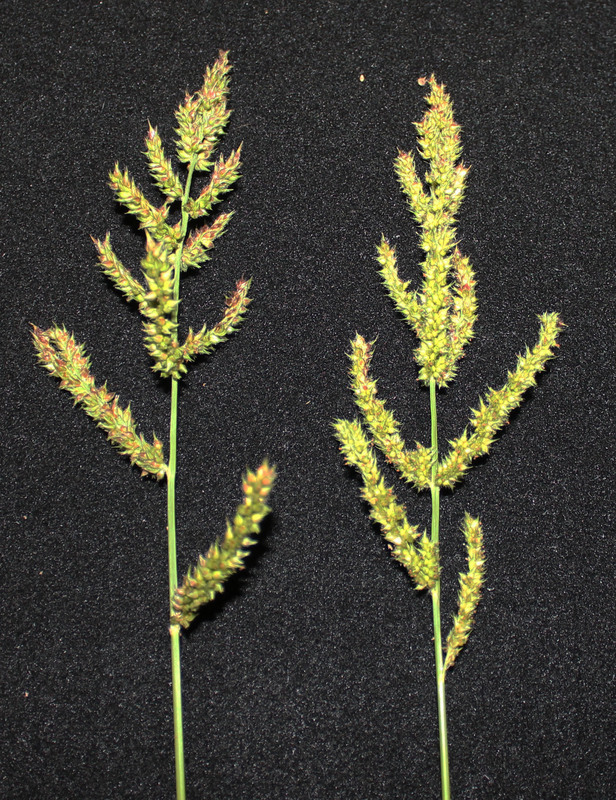 Late summer can be a frustrating time for homeowners as many different grasses are suddenly shooting up seedheads perhaps faster than the homeowner can mow them off. Many of these will die with the first frosts of autumn so applying herbicides is a waste of time. What homeowners need to remember is that if they are here this year, they will be there next year. The time to deal with them is in the spring before they get started. In the late summer and early fall, the best approach is to work on thickening up the lawn through proper mowing height, fertilization, and overseeding if the grass stand is thin. Then in the spring, a timely application of a crabgrass preventer will greatly reduce the number of these weeds you have to deal with. Read the label of your product and reapply part way through the summer if so directed. Here are the seedheads of some of the more common grassy weeds that I see in area yards. 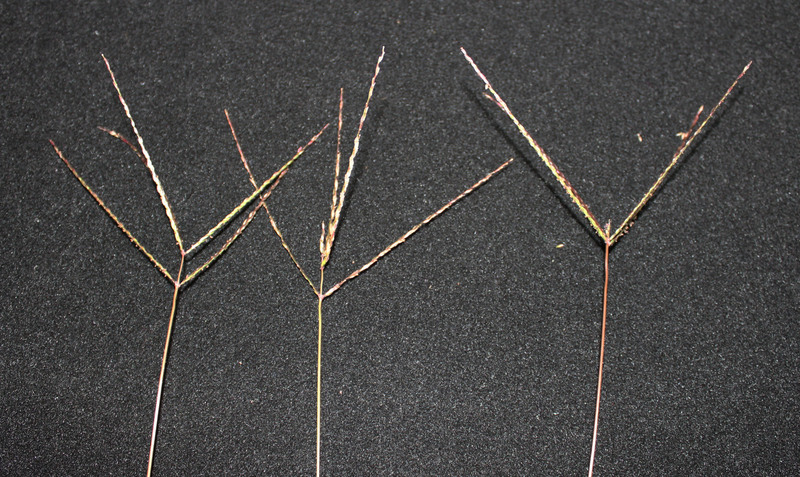 Crabgrass - There are several species of crabgrass (Digitaria) (smooth - D. ischaemum, hairy (large) - D. sanguinalis, slender - D. filiformis, and southern - D. ciliaris) but don't worry about identifying them - just know crabgrass. They all have very similar annoying tendencies, growth habits, and control). Foxtail - Foxtail (Setaria) is named for its seedhead which sort of looks like a seedhead. There are three regularly occurring species, green - S. viridis, yellow - S. glauca and giant - S. faberi. 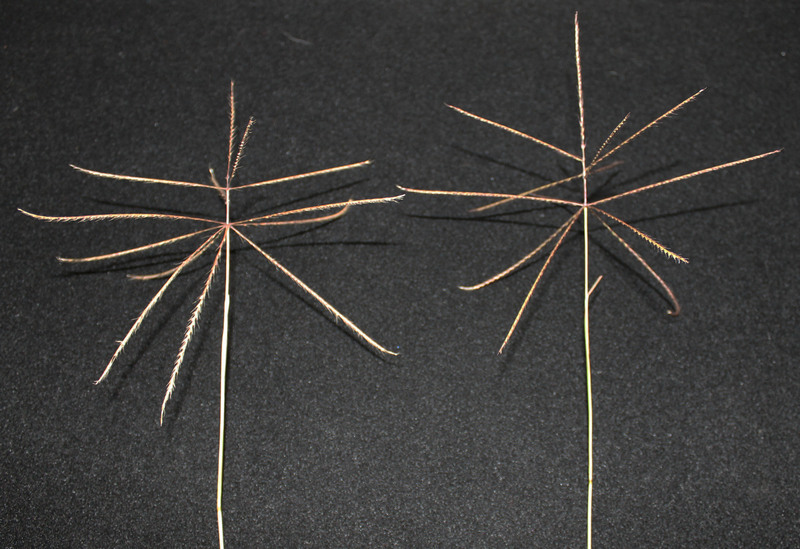 Once it's headed out they are fairly easy to differentiate based on size of seed and size of seedhead (and plant). As with crabgrass though, it doesn't matter what species it is as growth habit and control is all the same. Figure 2. - Foxtail seedheads. 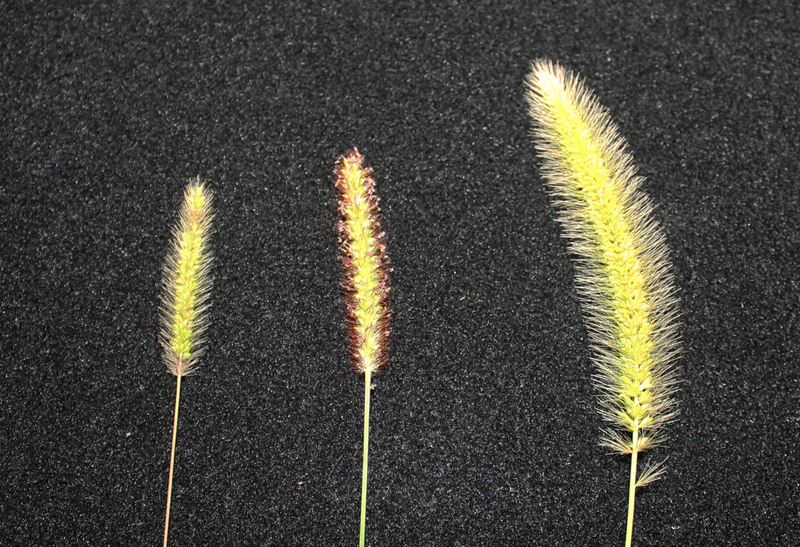 Left to right: Green Foxtail, Yellow Foxtail, Giant Foxtail. Figure 3. Barnyard Grass seedheads. Windmill Grass - Unlike the above grasses that are annual and not-native to North America, Windmill Grass (Chloris verticillata) is native and a perennial. It seems to become more prevalent in droughty seasons. The seedhead breaks off at maturity and tumbles in the wind spreading it's seeds as it goes. At the current time (2018) the only selective herbicide labeled for Windmill Grass control is mesotrione (sold as Tenacity). Treatment should occur from mid to late June through early July. Since this is a perennial, crabgrass preventers will not control established plants. Figure 4. Windmill Grass seedheads.